Let me tell you first that I’m not the biggest fan of the Werewolf genre, there have been a handful of films I can say that were good and didn’t also involve vampires, I mean how many stories can you tell about a creature that only transforms on a full moon night? So I was surprised when I found myself loving the first two films in this series, the first film was a metaphor for becoming an adult(yes I know it was more specifically for how a woman becomes an adult, but I’m a guy)and the 2nd film seem to deal with how one deals with their new station in life, the ending for the 2nd film was amazing and left you wanting more, as Bridgette no longer can keep from transforming and Ghost who is even more depraved than the psycho’s that were committed keeping her as a pet. The third film does none of this, it doesn’t capitalize on the 2nd films story and it restarts everything as a prequel. Now keep in mind I’ve only seen this film once and it as a while, so they’ll be no spoiling as I can only remember how bad it all was and therefore cared nothing for remembering plot points. The saddest thing with this film is that Katherine Isabelle (whose character died in the first, so they had to find a way to keep her in the films) and Emily Perkins (who has been the real star of these films) were a bore, the chemistry felt between the two doesn’t seem to be there, although the characters are different they are supposed to be the sister ancestors of the original sister and should have a little similarity in the way the two connect. 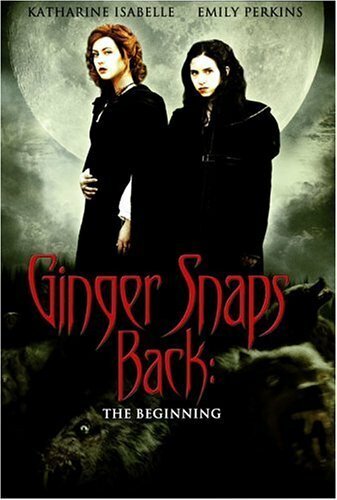 The writers could have done an “origin” tale of the werewolf that bit Ginger, but instead they just wanted to keep them in the film somehow. In my opinion the other story would have been more interesting. Aside from the main actors the other actors are equally as bad, nothing even worth remembering from them. I remember when I watched this film, I found myself wondering how the hell this was greenlit? Was this there idea of making a TV Series? Were they under some three picture contract and had no continuing film to make? I heard the makers want to make a TV series centering on Ghost and Bridgette being locked up, I hope if they do they take this out of continuity. I would not recommend this, if you happen to get it I hope its part of a collection, cause it isn’t worth your money.